Workers of the University of Calabar Teaching Hospital (UTCH) in Cross River State have protested the non payment of their eighteen (18) month salary. The aggrieved workers staged the protest on Friday. When visited the hospital, patients and some workers in the institution were stranded as the hospital was shut down. 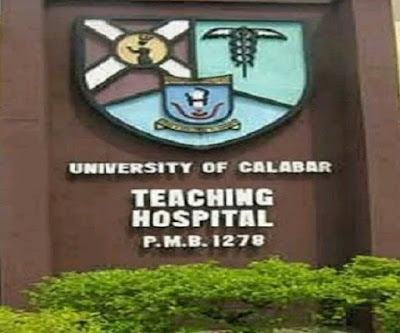 A nurse who pleaded for anonymity said that security men in the hospital who were engaged on casual work locked out both the management and the staff of the hospital because of the unpaid salaries. “We came to work this morning only to discover that all the offices, except the emergency ward, were locked by the security men in the hospital who were working on casual basis. “They have been complaining about the unpaid salaries. To make matters worse, management decided to engage another set of people to do the security work and I think that angered them,” she said. When newsmen visited the hospital, they were told that the Chief Medical Director (CMD), Prof. Thomas Agan was holding a meeting with the striking workers. However, the CMD ignored the text message send to him by newsmen and no principal officer of the hospital was on sight to speak.